Hi all! 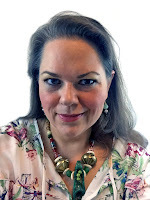 It's Gwen back again with the latest installment of Gwen's Gems! 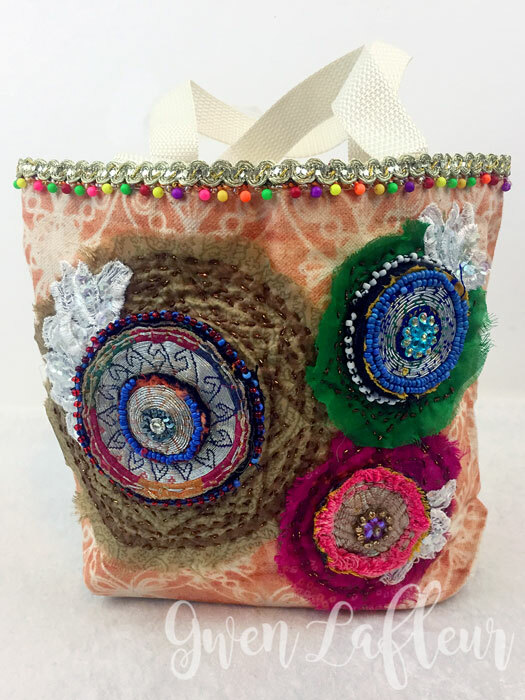 Last month I was blessed to spend nearly two weeks on an Arts & Crafts Expedition in India where I learned about various crafts from the area and even got to try some of them out! 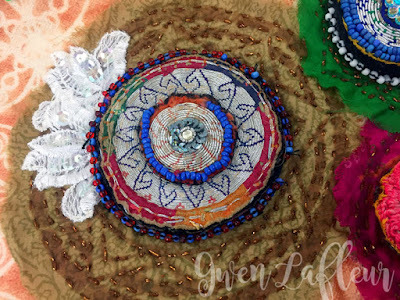 One of the workshops I participated in was Kantha quilting, and I thought it would be a fun technique to use with my stencils. 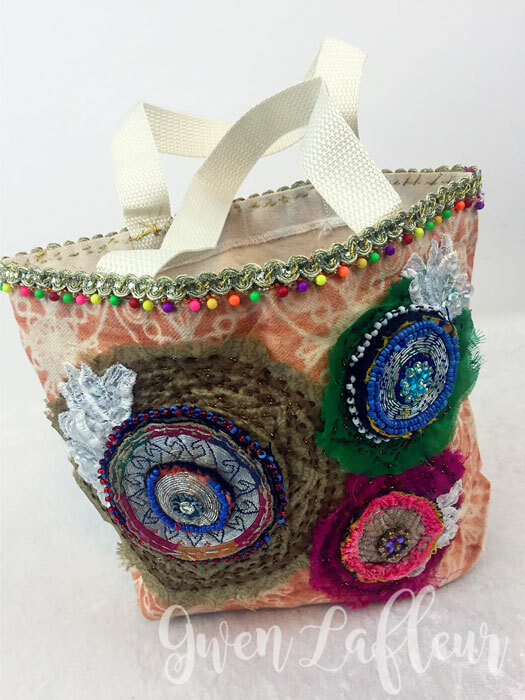 What that in mind, I decided that a good project to start with would be a small handbag. Here's how it all came together! I started with a small, plain canvas bag that I picked up at the craft store, then I stenciled it front and back with my Ornamental Petals Screen stencil and some orange Archival Ink. 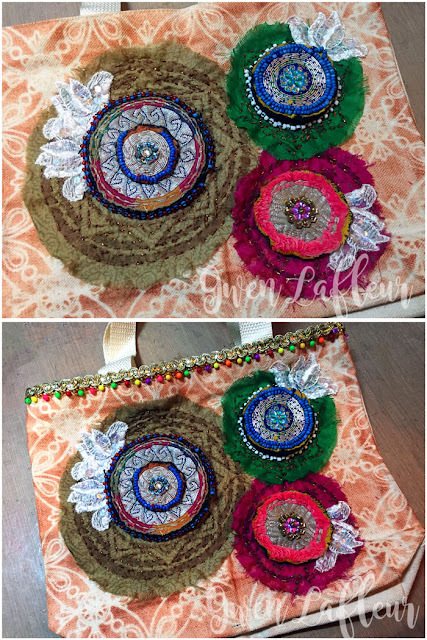 I knew that I wanted to add some embellishments to the bag and to do the stitching on those, so I picked out some fabric scraps and then pulled out some stencils that had different sizes of round shapes that I could use to make the stitched base for each embellishment. I started with the smallest one and stenciled the center section from one of the designs on my Art Deco Borders stencil onto the fabric using a slightly darker shade of Archival Ink - I wanted it just dark enough that I could see the pattern, but I didn't want the ink itself to stand out too much. 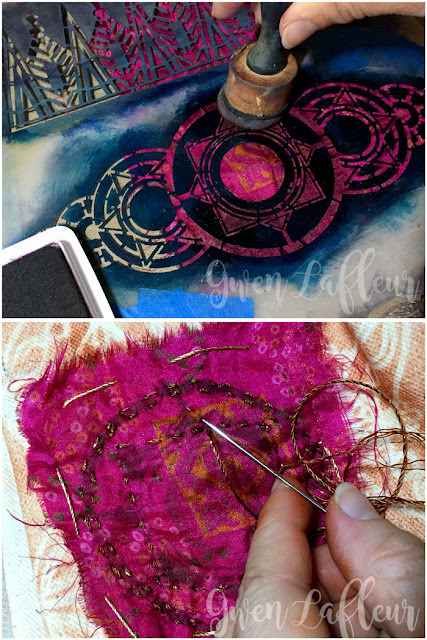 With that done, I basted the fabric onto my canvas bag and then used a metallic copper thread for the Kantha stitching - I just outlined the pattern using the traditional running stitch, leaving out the center areas that I knew were going to be covered. There's really not a whole lot to Kantha stitching... the goal is to keep the size of the stitches even, and to have the space between each stitch be about the same size as the stitch itself. 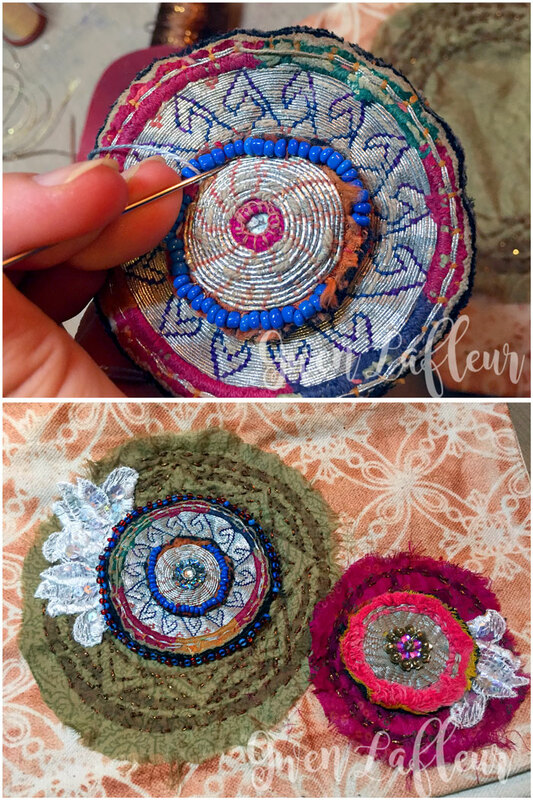 When the stitching was done, I pulled out some vintage sequined appliques from my stash and added one to the design - sewing it in place, then I added a vintage embroidered Kuchi patch on top and stitched it down. 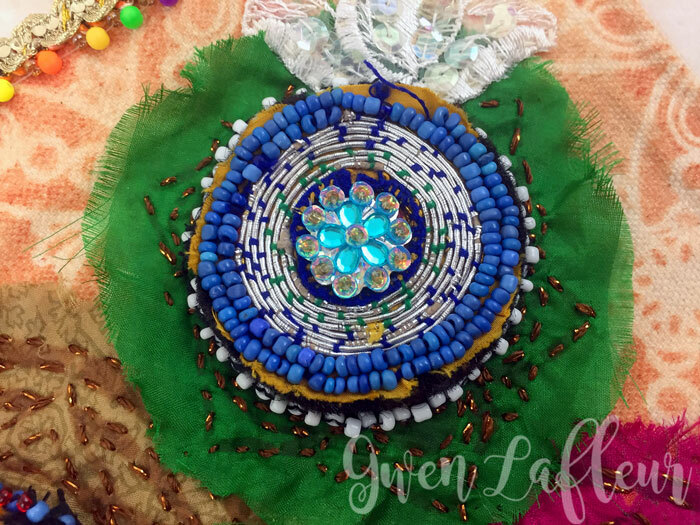 I also added a small sari applique into the center for a little sparkle. With the first one done, I moved on to the next, and largest embellishment. 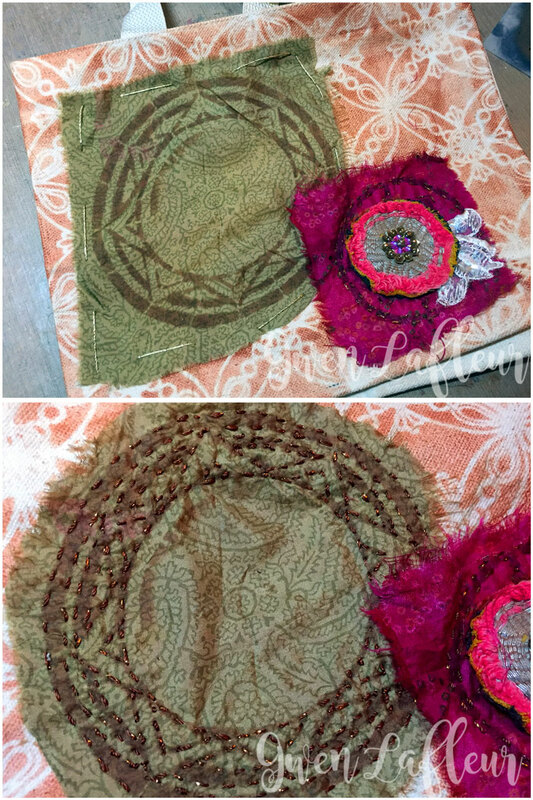 For this one I used my Art Deco Medallion stencil and inked through it onto some green fabric, then repeated the process with the basting and Kantha stitching. 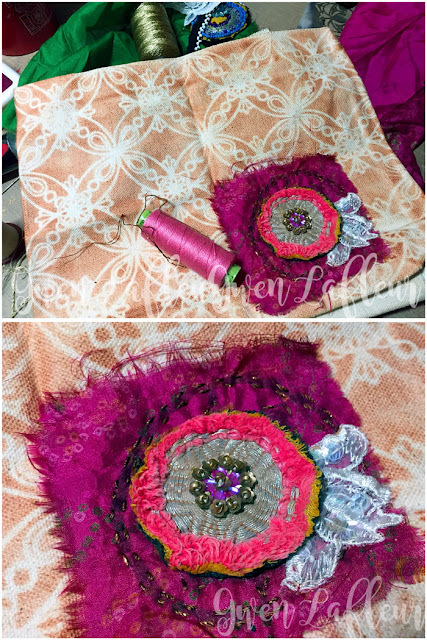 I had cut part of the fabric to fit it under the one already there, then decided to go ahead and cut and fray the rest of it to make a circle embellishment. I'm glad it worked out that way... I liked the circles much better! Again, I followed the same process to embellish, only I added two of the sequined appliques since it was a larger circle. For the center of this one, I layered a small Kuchi patch on top of a larger embroidered one and stitched them together (I like the old, really beat up ones that I cull out of my store stock. They have so much character!) I glued another sari applique into the center, then stitched the whole thing into the middle of my medallion. 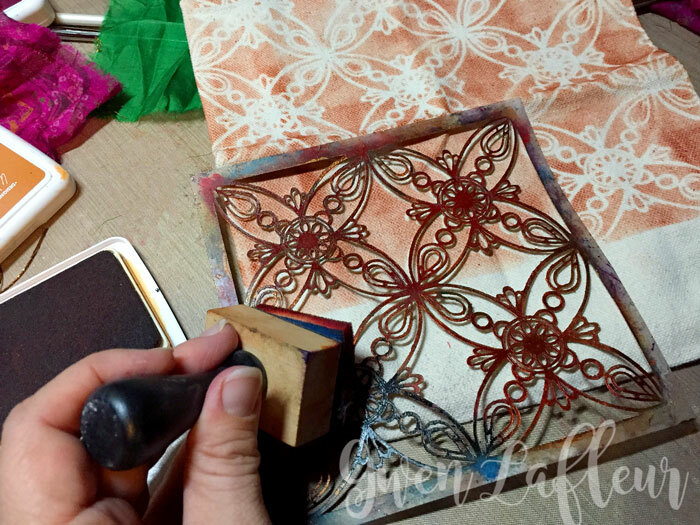 I repeated the process one more time using my Decorative 6-Petal Flower stencil as the pattern, then embellished as before. Finally, I stitched two trims layered on top of each other around the top opening of the bag, and voila! Finished! I'm really happy with how this turned out, and looking forward to finding the perfect time to use it! Thanks so much for stopping by today... 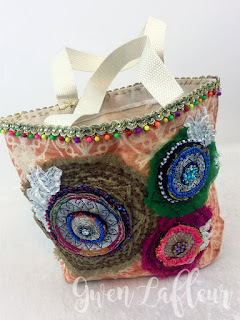 I hope you enjoyed today's project and tutorial as much as I enjoyed making it! That is so cute and creative! LOVE! Spectacular bag Gwen!! Wow and WOW!! I absolutely love the way you used the stencils and then quilting them- brilliant! 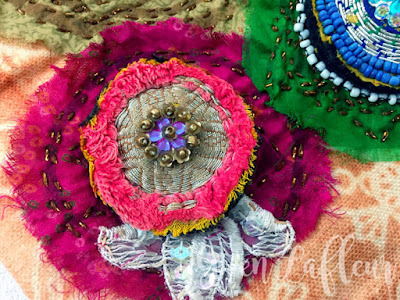 These Kuchi's with their stencils and stitching are such beautiful flowered embellishments! Well done! Thanks Jackie! I didn't realize I was turning them into flowers until it was pretty much done. Serendipity, I guess! Stellar! Love everything about this bag. Such great use of stencils and other materials. Thanks so much Denise! Much appreciated!